"Hail Ignatius!" Treasure your Saint Ignatius education? Become a partner in advancing the mission of Saint Ignatius College Prep and leave an enduring legacy by joining the Fr. 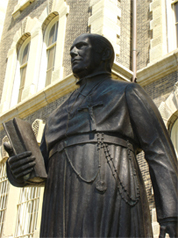 Arnold Damen, S.J. Society. What is the Fr. Arnold Damen, S.J. Society? Becoming a member of the Fr. Arnold Damen, S.J. Society is simple. Contact Saint Ignatius College Prep and let us know you are making a planned gift to the school. Once your estate plan is done, you can send us a completed Legacy Gift Confirmation form. Membership allows us to thank you and recognize you as a benefactor. Your generosity will impact the lives of countless students for the generations yet to come at Chicago's first Jesuit School. Also, it may inspire others to give back as well.